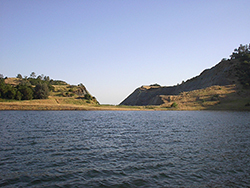 The Calaveras County Air Pollution Control District (District) is part of the Mountain Counties Air Basin. The District is recognized as a Special District and is governed by the Calaveras County Air Pollution Control Board. The primary goal of the District is to protect public health by managing the county's air quality through educating the public and enforcement of District rules and California Air Resources Control Board - Air Toxic Control Measures that result in the reduction of air pollutants and contaminants. While there are minimal sources that impact air quality within the District, Calaveras County does experience air quality impacts from the Central Valley through transport pollutants. The most visible impacts to air quality within the District is a result of open burning of vegetation as conducted by individual property owners, industry, and state agencies for purposes of reducing wild land fire hazards. Permits and inspects stationary sources of air pollution. These sources include, but are not limited to; gasoline dispensing facilities (gas stations), rock quarries, foundries, auto paint spray booths, boilers, wood processing equipment, and diesel generators greater than 50 brake horsepower (bhp). Provides Burn Day information, issues burn permits, and responds to smoke complaints. Responds to fugitive dust complaints. Manages and coordinates Smoke Management Plans for prescribed burns from entities such as Cal-Fire, the Forest Service, National Forest personnel, private companies, and residents. Manages the Carl Moyer Grant Program that provides funding for upgrading mobile sources such as new school buses and retrofit or replacement of diesel engines. Manages other grant programs such as woodstove changeouts and lawn mower replacement when available. for demolition and renovation permit requirements. Air quality permits are issued to ensure that all equipment and processes that have the potential to emit air contaminates comply with Federal, State and local District regulations. Through the issuance of permits, District staff are able to work closely with businesses, agencies and residents of Calaveras County to help meet the District's mission of protecting public health through promotion of air quality. Please call the Air District at (209) 754-6399 to verify whether or not your facility will need an Air Pollution Control Permit to Operate.